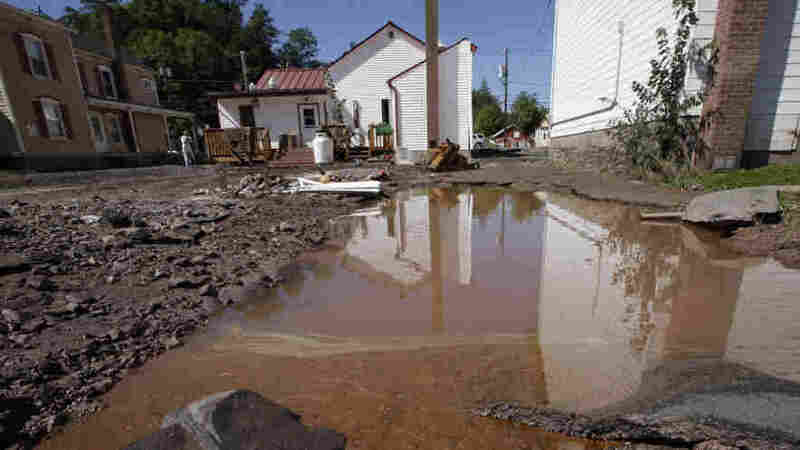 Post-Irene Cleanup May Damage Environment Towns and villages in Vermont and upstate New York are beginning to recover from Tropical Storm Irene. But scientists say the widespread chemical and sewage spills, and the cleanup's effect on trout streams, could cause lasting environmental damage. Scientists are beginning to get a picture of the environmental impact of Tropical Storm Irene, which ripped through some of the East Coast's most pristine rivers, triggering hundreds of oil, chemical and sewage spills. Now, some environmental groups worry that the cleanup could cause even more harm. When Irene blasted through the Adirondack Mountains late last month, brooks and streams that are usually docile this time of year jumped their banks. "The whole forest is falling down. Wow!" someone yells in a video posted on YouTube. This video shows Johns Brook carving a new channel through the forest, as trees and rocks go tumbling. The video shows Johns Brook in New York carving a new channel through the forest, as trees and rocks go tumbling. The storm triggered vast landslides that reshaped some of the wildest mountain landscapes in the East, washing away ponds and shifting rivers into new channels. Joe Martens, head of New York state's Department of Environmental Conservation, said no one's sure yet what all that chaos did to wildlife — including rare strains of brook trout. "The streams and rivers around the flood-impacted areas have taken a terrific beating," Martens said. "The impacts of the storm were devastating in places." Swollen rivers also flushed loose a huge amount of human gunk. In Keene, N.Y., Fiona Burns stood right here on the porch of her shop on Main Street, watching as the Ausable River scooped up septic tanks and other debris. "This was all a river," Burns said. "Refrigerators floating down, bikes, propane tanks exploded — it was kind of surreal." Weeks after the storm, riverbanks here are still cluttered with trash, and Martens said cleanup crews are trying to contain loose materials. "We've responded to a record number of oil spills, well over 1,100. There were places where automobiles went downstream," he said. "Buses, equipment, machinery. We're still out there now in places like Binghamton, recovering tanks that were lodged loose and had to be recovered from streams." Martens said his scientists are still in crisis mode and haven't begun to sort out what the cumulative impacts of all those spills will be. In the weeks following the storm, it's also common to see bulldozers and backhoes digging in the middle of these once-pristine rivers. They're allowed here because Gov. Andrew Cuomo temporarily suspended many of New York's environmental rules, shelving state laws protecting wetlands and scenic rivers. That move drew praise from local leaders and residents, who said cleanup work has to be done fast, before winter weather sets in. But some environmental activists and scientists say construction crews like one working on the bank of Styles Brook — just outside of Keene — are working too fast, not taking necessary precautions. Carol Treadwell is a researcher who studies the geology of rivers in the Adirondacks and is head of the Ausable River Association. 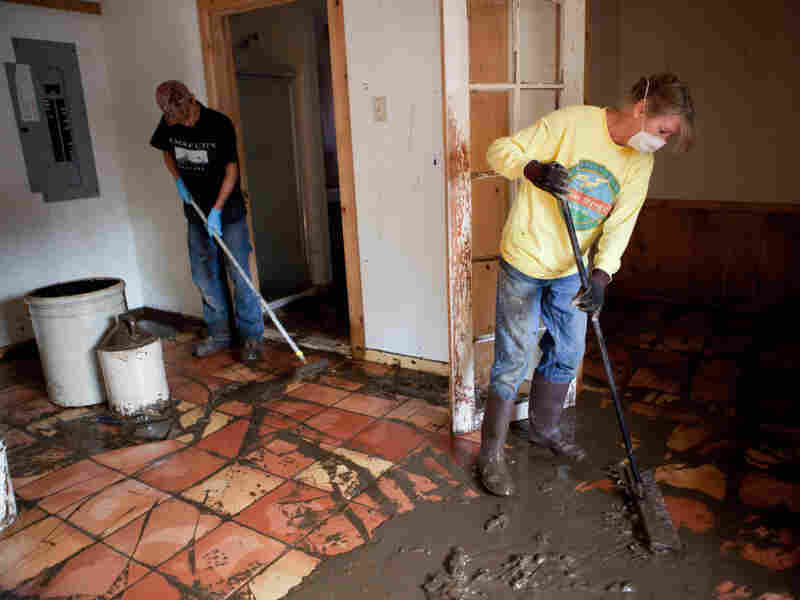 Joyce Roy (right) and Oscar Smith clean up mud from flooding caused by Tropical Storm Irene, in an apartment on West Main Street last month in Wilmington, Vt. The nearby Deerfield River overflowed its banks a few days earlier, inundating homes and businesses in the downtown area. "I can understand needing to do triage and put the roads back quickly so we can bring commerce back in. But I think we've gone a little further than that, and it's turned into the Wild, Wild West." She said contractors are dredging too many streams, transforming wild pools and rapids that are crucial trout habitat into what she describes as "drainage ditches." "It's very shallow, it has steep sides with a flat bottom and very little habitat for trout," she said. State officials said they are monitoring projects like the one on Styles Brook, and they don't think cleanup work is doing permanent harm. "We've come up with some very creative governmental initiatives," Cuomo said. "We want to waive certain [environmental] regulations and permits, which normally eat up some time." Environmental rules in areas affected by Irene and by Tropical Storm Lee don't go back into effect until the end of this month.